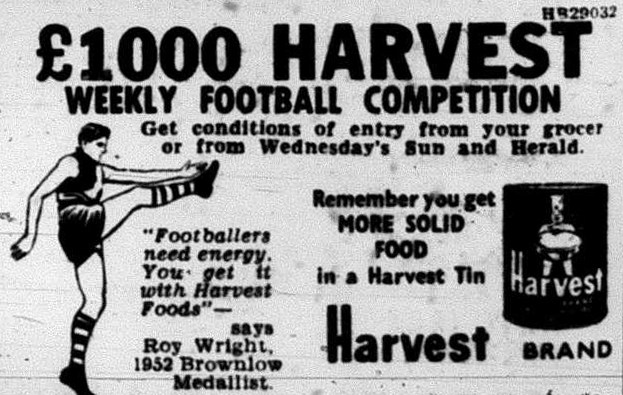 Footscray in 1953 were on the cusp of premiership success. This was the year they won their first ever final, when they defeated Essendon in the semi-final by 8 points. They reached the preliminary final which they lost to Geelong by 26 points. It would be another year before the Bulldogs would finally taste premiership glory by winning their only Grand Final. 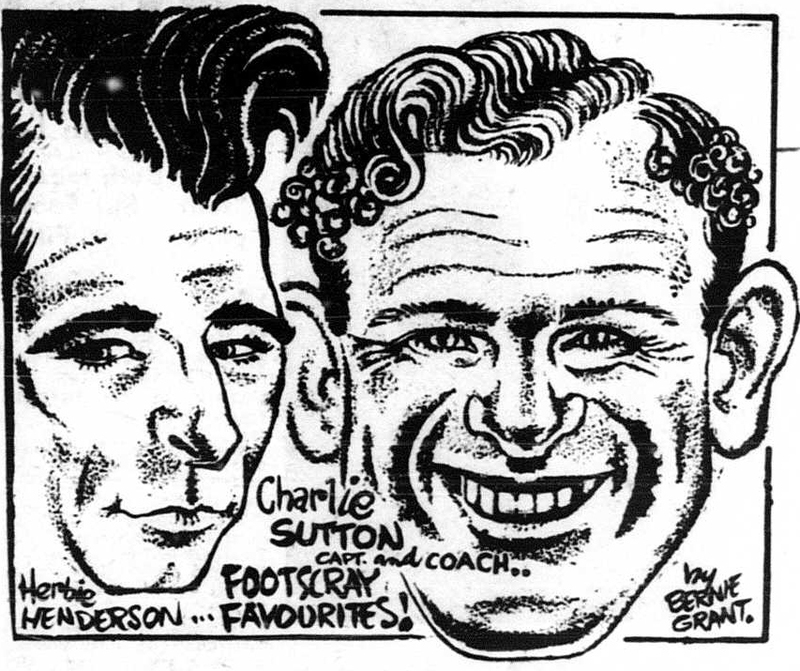 Footscray were captained and coached by Charlie Sutton. He debuted with the club in 1942 and played 173 games in a career that lasted 12 years. 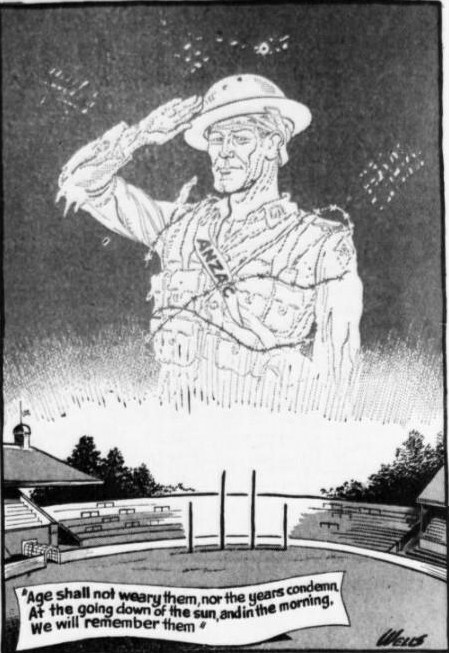 (He did not play between 1943-1945) He became captain/coach of the Bulldogs in 1951, a year after he won the best & fairest award which would subsequently be named after him. He would remain captain until his retirement as a player in 1955 and stay as coach until he was unceremoniously dumped midway through the 1957 season, when Ted Whitten took over. He is also a member of Footscray’s team of the century. He is a legend of the Footscray Football Club. 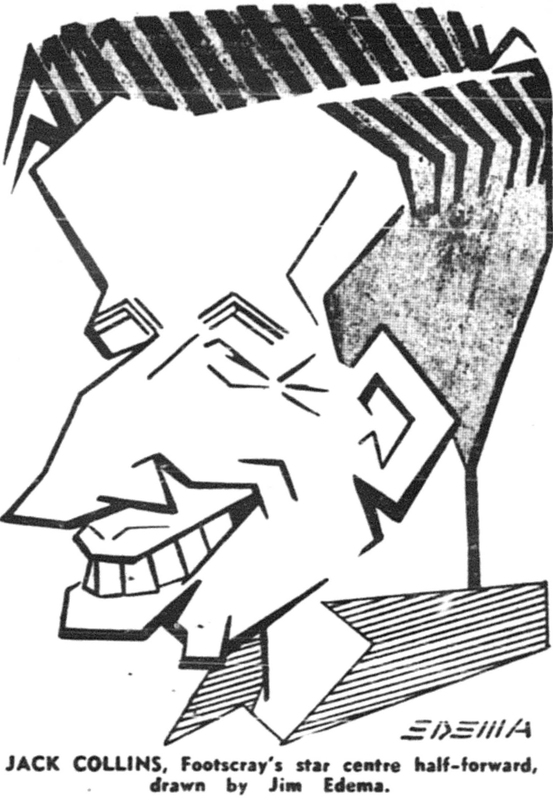 Ruckman Harvey Stevens won Footscrays’ best & fairest award in 1953. 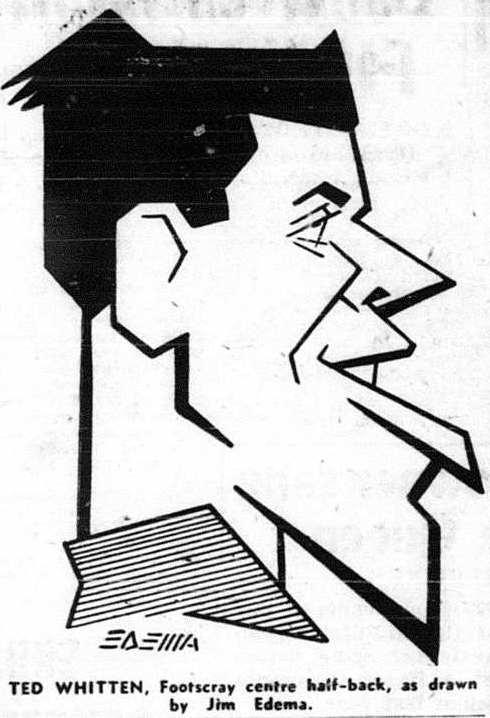 Two weeks prior to the start of the 1953 season Stevens was dumped by Collingwood and was fortunately picked up by the Bulldogs just prior to round 3. Stevens played VFL footy for 10 years, with 5 seasons at Collingwood where he played 55 games, and 5 at Footscray where he played 72 games. He played in Collingwood’s losing 1952 Grand Final side, where he was tried without success at full-forward, even though he had never played in that position before. Many feel that he was made the scapegoat for that loss and despite performing well in the 1953 preseason he was dumped from the team before the start of the new season. 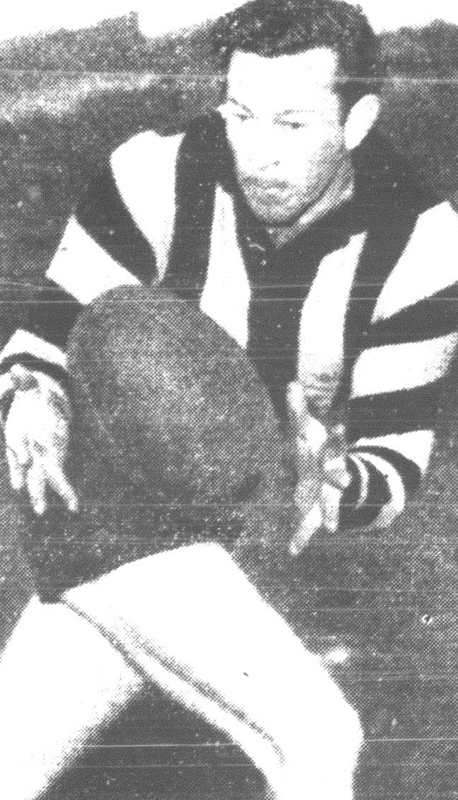 Stevens became a member of the Bulldogs’ 1954 premiership side and captained Footscray in 1957. 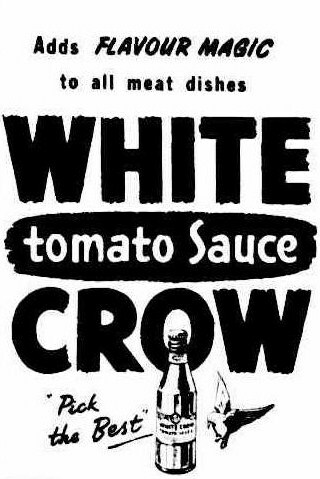 The most famous Bulldog of all was a member of the 1953 side. 1953 was the 3rd VFL season for the legendary Ted Whitten. ‘E.J’ had played just 29 games prior to 1953. To many people he was the embodiment of everything Footscray, he captained the club from 1957 until his retirement as a player in 1970. Teddy also coached the club from July 1957 until 1966, when his predecessor Charlie Sutton took over the helm, and again from 1969 until 1972, when Collingwood’s greatest ever player Bob Rose took over the coaching role. Whitten won the Bulldogs’ best and fairest in 1954, 57, 58, 59 and 61 and was their leading goal kicker in 1961, 62, 64 and 68. He is the captain of both the Western Bulldogs‘ team of the century and AFL team of the century. Like Sutton he is a legend of the Western Bulldogs Football Club. In 1953 the leading goal kicker for Footscray was Jack Collins who kicked 50 goals for the season. 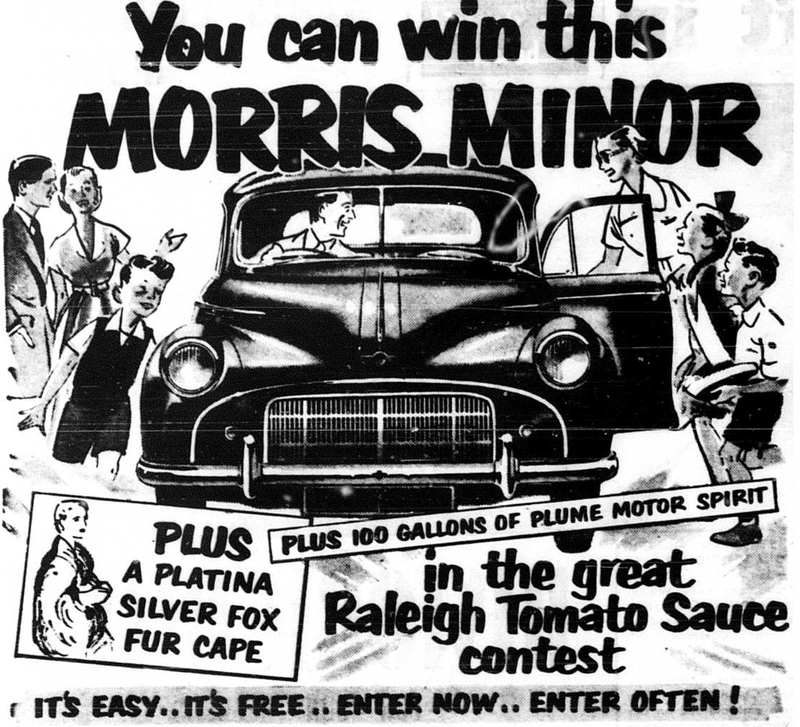 Collins won the best & fairest award for the Bulldogs in 1951 and 52. 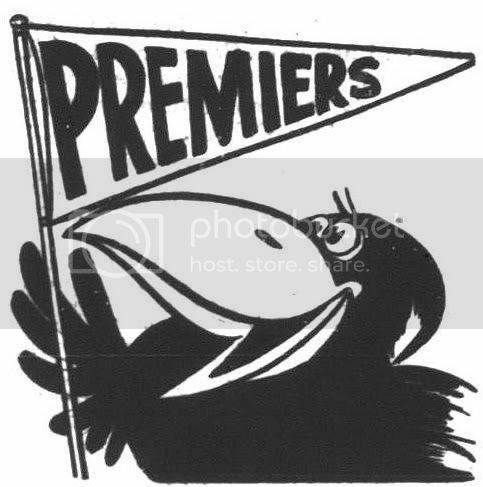 His 1953 season is perhaps remembered mostly for the controversy that occurred in the final round of the home & away season when he and Collingwood’s Frank Tuck clashed which caused both players to be suspended for the finals series. Collins played 154 games for Footscray over 9 seasons and kicked 385 career goals. Peter Box was another of Footscray’s top players of the 1950s. He debuted in 1951 but missed the entire 1952 season through injury. In 1956 he won the Brownlow Medal after winning Footscray’s best & fairest in 1955. Don Ross the 1956 Footscray best & fairest was playing his second season in 1953. The Footscray backline of 1953 also featured some of their all-time great players including Wally Donald and Herb Henderson. The Bulldogs conceded only 959 points for the season, the lowest in the VFL history to that date. 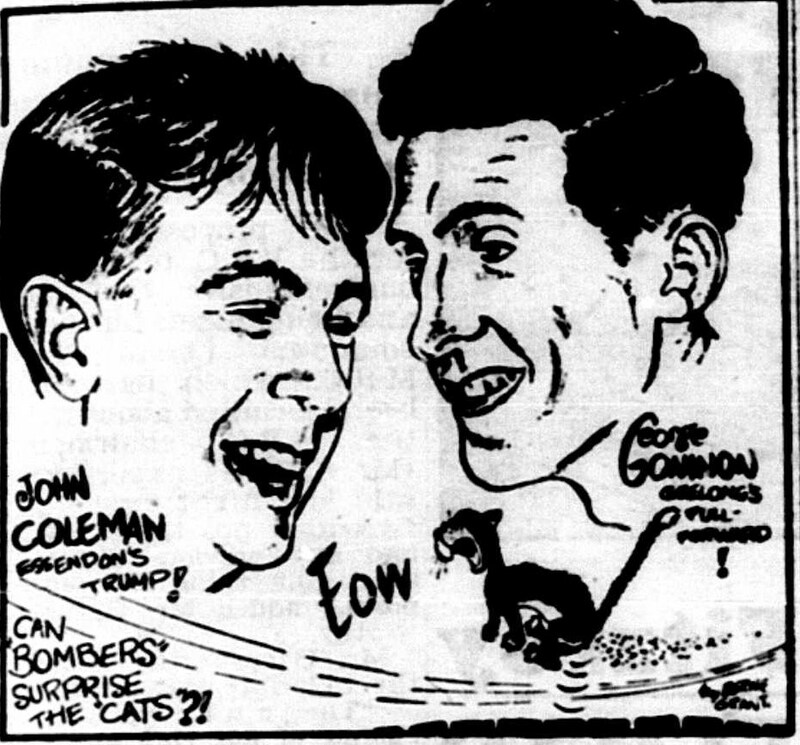 Jack Dyer in the Sun predicted that Collingwood would easily account for the young Tigers in their round 6 clash at Victoria Park, which they did by 23 points.The Magpie’s stocks were buoyed by the returns of Mocha Dunstan and Bill Twomey from injury. However vice-captain Neil Mann, a star in recent weeks, was out of the team to injury sustained in the match against Hawthorn. Geelong remained at the top of the ladder with a 53 point thrashing of South Melbourne at Kardinia Park. Footscray cemented second spot by beating St Kilda, while North Melbourne dropped to fourth after being defeated by Essendon by 17, with Coleman kicking 3 goals for the victors and Marchesi 4 for the losers. Hawthorn recorded their first win of the season over a hapless Carlton by 20 points, with former Collingwood player Kevin ‘Skeeter’ Coghlan and Pat Cash kicking 3 goals each. The Coronation of Queen Elizabeth II occurred at Westminster Abbey on June 2, 1953. The entire ceremony was broadcast on television in the around the world and was the first major international event to be broadcast on the new medium. We Australians missed out, as TV would not arrive down under for another 3 years. On May 29 Edmund Hilary and Tenzing Norgay reached the summit of Mount Everest, the news of this remarkable event reaching the world’s media on June 2, with Queen Elizabeth knighting the New Zealander as a thankyou for this Coronation gift. 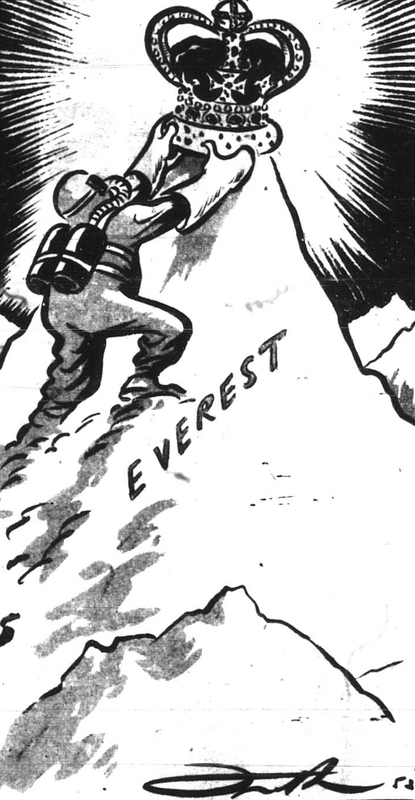 The Herald headline to mark this event was “British Claim Everest”. I know that things were different then and that the British Empire was still shining, yet it is difficult to think of a New Zealand beekeeper and a Nepalese sherpa as being British. The Potts went to London for the Coronation and got to watch it on television, something that their friends back home in Melbourne could not do! Collingwood were expected to dominate their Round 5 encounter with Hawthorn at Victoria Park and ended up winning by 70 points. In front of just 9,627 people (1) in atrocious conditions both teams struggled with their being just 12 points separating the two teams at three quarter time. The Magpies finally broke the shackles with a devastating 9 goal final quarter. Geelong beat Richmond by 54 points with Goninon kicking 11 goals. 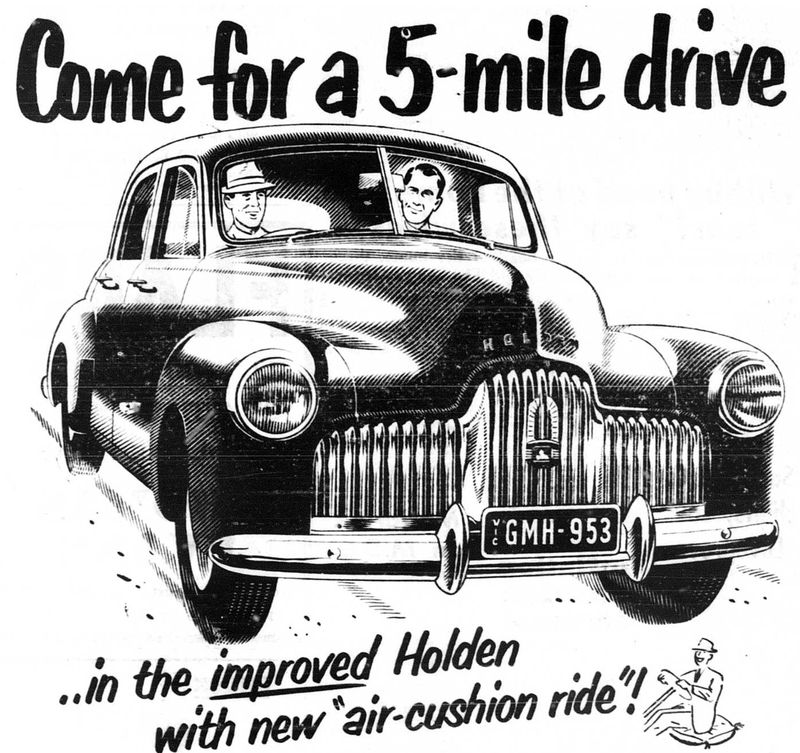 John Coleman could only manage 2 goals in Essendon’s 11 point loss to Melbourne. Collingwood ventured to Princes Park in May to meet their oldest foe Carlton. The Magpies‘s stocks were still depleted with injury, while Carlton were just outside the four after defeating Melbourne and Richmond and suffering a narrow loss to Footscray in round 1. Geelong kept up their unbeaten run with a 14 point victory over Essendon. Goninon kicked 6 goals and Trezise 3 while the Bombers’ Coleman had an off day by his standards and could only manage 4 majors, in what was the battle of the VFL’s best goal-scorers. 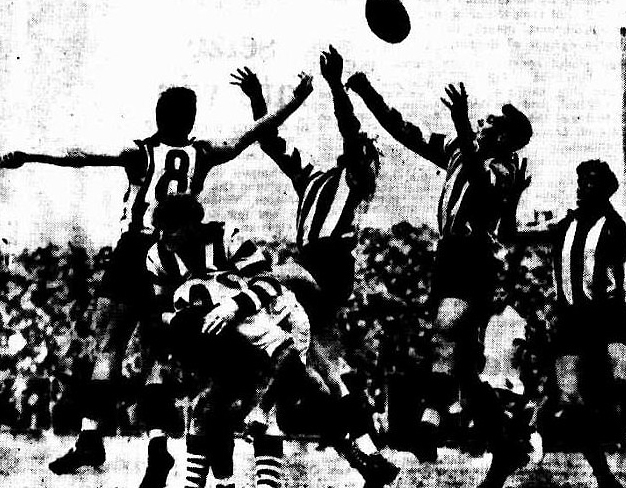 North Melbourne suffered their first defeat of the season to Fitzroy who had crept into fourth place on the ladder, while Footscray was now placed second with a 45 point win over lowly Melbourne, with Ted Whitten being amongst the best on the ground. Hawthorn and Melbourne were languishing on the bottom of the ladder winless while Richmond were 10th with just one win. In his preview of the match the Sporting Globe’s H.A. de Lacy referred to Collingwood’s Mick Twomey as Mike Twomey. I’m not sure if this is his fault or that of his editor/subeditor though. Mick Twomey did not play the match due to a torn ‘monkey’ muscle according to Percy Taylor in the Argus. Google told me that a ‘monkey muscle’ is a calf muscle. Jack Finck only kicked 8 goals in his entire career at Collingwood, with half that tally coming in this match. Rocky Marciano retained the World Heavyweight Boxing Title with a knockout victory over Jersey Joe Walcott in the first round of their highly anticipated bout in Chicago. Carlton recorded their first win of the season defeating the hapless Melbourne. Geelong were much too strong for Footscray defeating them by 41points, with Trezise kicking 8 goals and Goninon 3 for the Cats, cementing their place at the top of the VFL ladder. John Coleman kicked 11 of Essendon’s 13 goals in their 10 point loss to the Swans, while Fitzroy recorded a 1 point victory over Richmond, with Joe Hickey kicking 6 goals for the Gorillas. It is quite interesting reading the old newspaper reports of the matches and seeing the different styles that each journalist/commentator uses while writing their match report. One thing I found odd was that twice in his article on this match, the Herald’s Alf Brown referred to North as Melbourne. I guess this was a mistake on behalf of the editor and shows the perils with trying to get the paper out in the evening after the conclusion of the match. 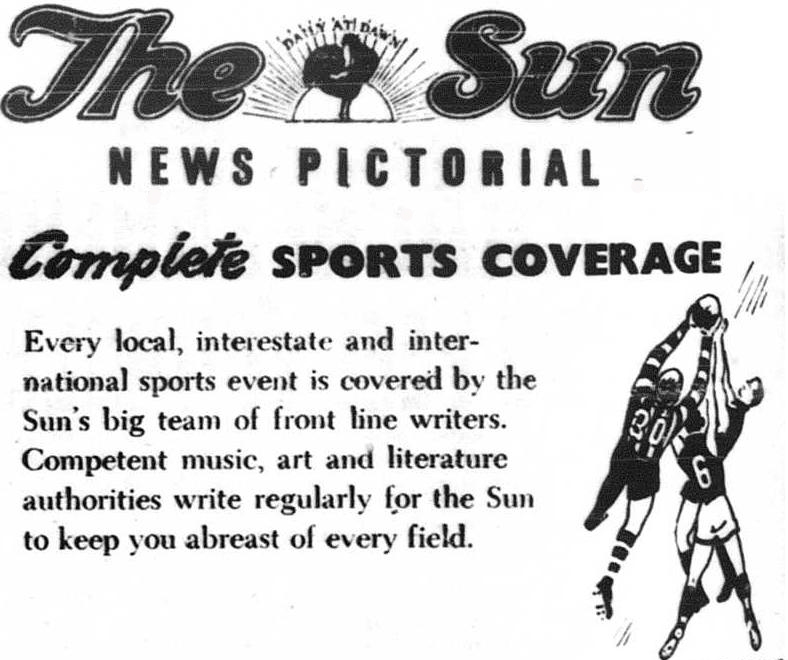 This is something that is not so much of a problem these days as there are no longer any ‘evening editions’ of the Melbourne newspapers. Magpies’ patron John Wren put up a £100 purse to whoever won the match. (14) As a result both teams played most of their best players (15) which would have consequences for Collingwood as their full-forward Bill Twomey would miss the next few matches with an injury sustained in this match. 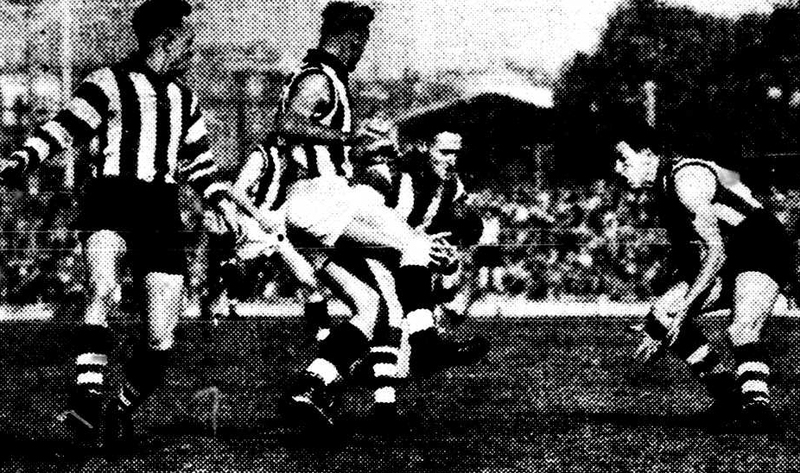 Collingwood played South Melbourne in the opening round of the 1953 VFL season at Victoria Park, and won convincingly by 41 points, with Bill Twomey kicking 9 of the teams’ 17 goals. Geelong defeated Hawthorn by 49 points, Essendon beat Fitzroy by 23 points with Coleman kicking 10 goals. Footscray scraped home over Carlton by just 5 points.